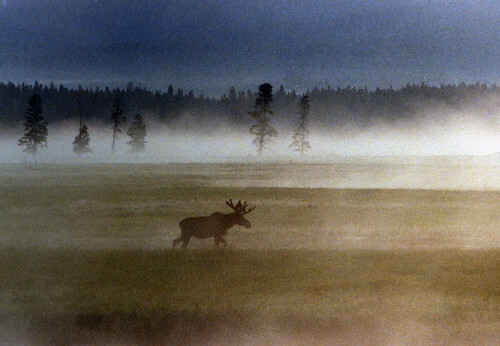 morning moose, originally uploaded by Steve took it. ok, first, let me just say this – don’t judge. if you feel the urge, leave now. thanks. my family hunts. not me or my sister, but my parents (well, mom usually just dresses in bright orange, carries a gun and keeps dad company) and most of my cousins hunt for various things. when you grow up in a hunting family, you learn respect for guns at an early age, you don’t get grossed out by a disemboweled deer or two hanging along the side of the garage, and you don’t think it’s bizarre when your mom tells you that she just won the moose lottery. for those unfamiliar with large game lotteries (not pick 5 or scratch off), basically there are certain animals that you must win a permit to hunt during a specific period of time, in a specified locale. my dad won the lottery ten or so years ago, got a little crew together and shot his moose providing the entire family more than enough moose-meat for a couple of years. they hope to repeat that experience this week. today my parents drove about five hours north to the maine/canada border where they like to camp, and tomorrow they will begin to scope the area. cousins and friends will meet them to help out when suddenly they have to pick up and cart away about a thousand pounds of moose, get it all cleaned up, protect it for the night (don’t want any pesky bears getting into it) and drive it back home to the butcher (who’s actually a friend of mine from highschool). i’m not going to use this space to argue the merits of hunting. let’s just wish them a safe and successful trip – i’ll keep everyone posted on their progress. 09 Oct	This entry was published on October 9, 2008 at 12:41 am. It’s filed under maine, nature, random stuff and tagged hunting, maine, moose hunt, moose lottery. Bookmark the permalink. Follow any comments here with the RSS feed for this post. Awesome! I want to see pictures of lobster and clam bakes next. THAT’s a great story. I don’t hunt. Couldn’t hunt. But I get it. Aren’t your parents in the lobster business as well (if I recall correctly)? Love it! Thanks for sharing that! hey drob! yep – they lobster too. thanks for coming by. first off, great picture. second, i have no real beef with hunting, but i grew up with plenty of kids who hunted and while some of them learned to respect guns, some got too comfortable with them and were plain reckless, so blanket statements like yours make me a little uncomfortable. it’s like those bumper stickers that say kids who hunt don’t mug old ladies. uh, yeah, sometimes they do. hi steve, thanks for the comment. i agree with you – i knew a few kids who were reckless too. guess i’m just speaking of my family experience. great point – thanks for reading my post and sharing your thoughts.